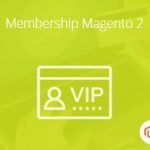 In the following post, we explore the Barcode Management Magento 2 extension by Magestore. 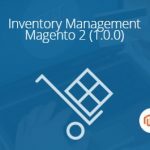 The tool is designed to improve the productivity of managing products and their attributes as well as simplify your interaction with the inventory. 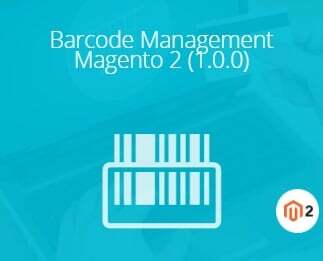 The core features of the Magestore Barcode Management Magento 2 module provides inline barcode management and editing, supports barcode import via CSV, allows you to generate and print unlimited barcodes for a product, etc. There are even barcode templates available within the module. The extension not only improves the overall productivity while you manage the inventory but also reduce the number of errors caused by the human factor. As for unlimited barcodes for a single product, this feature is useful if you want to set a specific barcode for a certain attribute, for instance, availability, price, name, and supplier. 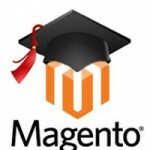 Let’s see the Barcode Management Magento 2 extension in action. Go to the Inventory Management tab. Here you can find all sections related to the extension. They are gathered under Barcode Management. You have: Barcode Listing, Generate Barcodes, Import Barcodes, Scan Barcodes, Print Barcodes, Barcode Generated History, Barcode Label Templates, and Barcode Settings. The Manage Barcodes screen contains a grid with barcodes (you can view each barcode, but it is already shown with brief information) as well as lets you generate or import barcodes. Besides, you can print barcodes in bulk. The Barcode Details screen (appears when you view a barcode from the grid) is divided into several sections. Barcode Information illustrates the following data: Barcode, Product SKU, Supplier, Created Date, Purchased Time. Next, there is Barcode Print Configuration. Here, you select a barcode template and specify the quantity to print. Note that each template can be previewed. The last section is Product Information. It shows product image, name, price, quantity, availability, and status. 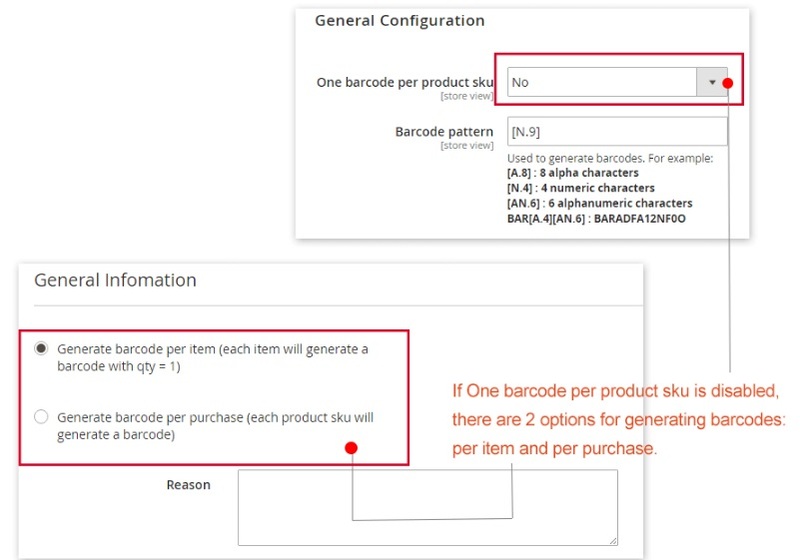 While generating barcodes, you should specify a reason and choose products. 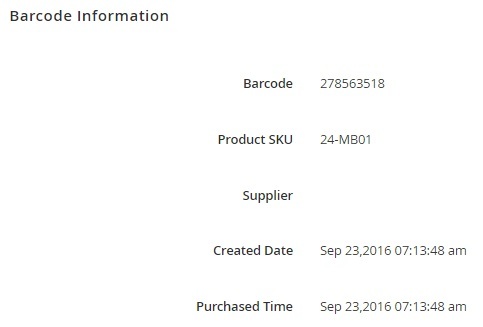 If the “One barcode per SKU” option is disabled, you can generate barcodes per item or per purchase. You can choose a CSV file and don’t forget to specify a reason. After scanning a barcode, you get both barcode and product information displayed. Note that it is possible to scan barcodes specifying their quantity as well as viewing additional details on each product. 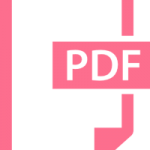 The Barcode Printing Configuration page has is divided into two parts: configuration parameters and the grid with barcodes. Note that it is possible to select the number of printed barcodes only after you choose a barcode on a grid. While viewing a detailed information on each history item, you can see when the barcode was created (Created At), by whom (Created By), and why (Reason). 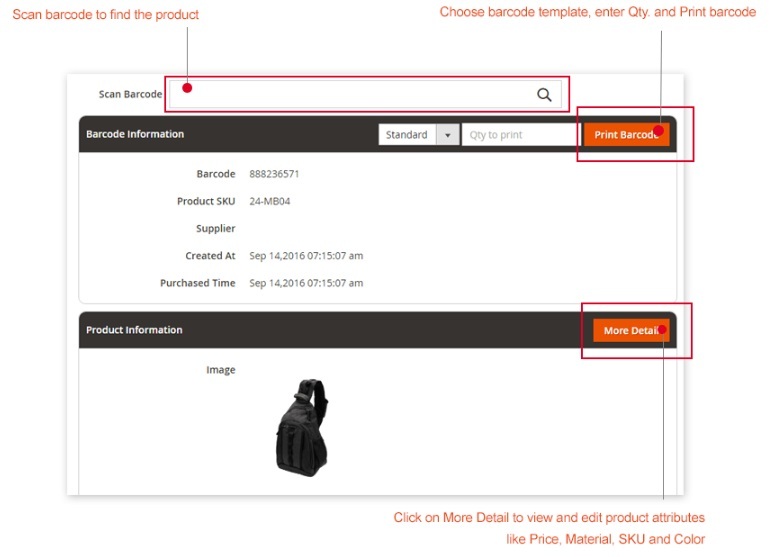 As for barcode templates, they are available on the Manage Barcode Label Templates page. You can edit the existing templates or create a new one. To create a new barcode template, select its label format (Standard Barcode, A4 Barcode, or Jewelry Barcode), specify a new template name, choose status (Active or Inactive), barcode symbology (a lot of options to choose from), and measurement unit, set the number of labels per row, and specify dimensions. In Barcode Settings, you can enable/disable the aforementioned “One barcode per product SKU” feature, specify a barcode pattern, as well as set a default barcode for printing.